The Trainer Snippets report shows what an excellent record Saeed Bin Suroor has on the all-weather courses. He's had 73 winners (30.93%) and 135 places (57.20%) from his last 236 runners, which has produced an Impact Value of 2.90, meaning he is almost three times more likely than average to have the winner. He runs Maghfoor is a competitive handicap over a mile and a half here today. The current form of Maghfoor is not great at all, however, the last time he raced over today's distance he was a good winner and last time out on the all-weather at Chelmsford, 14 furlongs appeared to really stretch his stamina. A return to a mile and a half and racing on the artificial surface will hopefully bring about an improvement which can see him go close. Both trainer and jockey have a good record here at Newcastle over the past year which is encouraging. Kevin Stott has ridden 12 winners (20.69%) and 23 places (39.66%) from 58 runners over the last year for level stakes profits of 5.13 and 12.17 respectively, and an Impact Value of 1.92. The sire of Maghfoor, Cape Cross, has a much higher strike rate with his runners on the all-weather compared to his overall average. 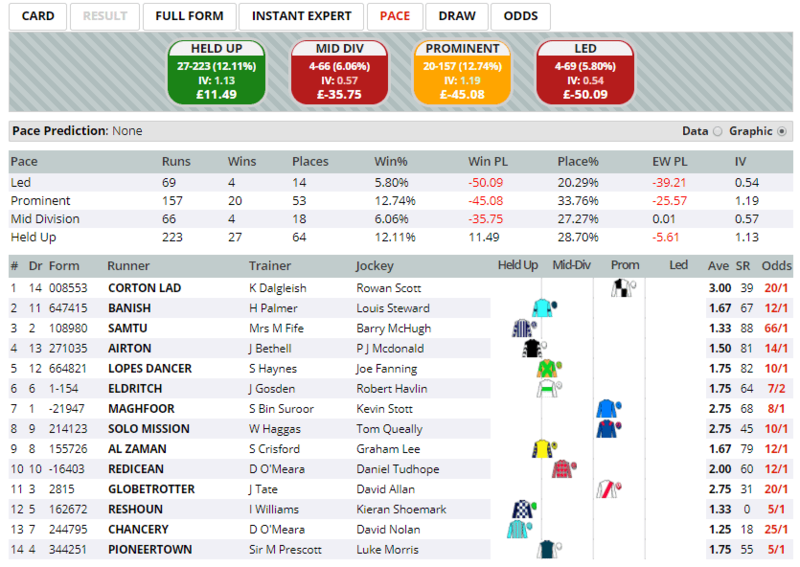 He is also showing a very healthy level stakes profit of 34.81 from 531 runners on the artificial courses. The Pace report shows that prominent runners and those that are held up have the best record here over this distance, with both boasting a strike rate of 12-13%. If he does manage to do this then I think Maghfoor has a good bit of potential improvement in him on this surface and can produce a good run at 8/1. Click here for the 17:45 at Newcastle.